The What: Wharfedale Pro has launched the Sigma Series of passive loudspeakers, specifically engineered for use in fixed installations. 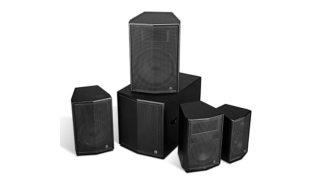 The series initially consists of four two-way models (8, 10, 12, and 15 inches) and an 18-inch subwoofer. All models are available in black or white finishes. The What Else: Each model of Sigma features the latest proprietary Wharfedale Pro driver technology. Using a curvilinear, double-roll surround system for the LF driver, Wharfedale Pro engineers have ensured stability for low- through to mid-range frequencies. Meanwhile, the HF compression driver features a 44mm diaphragm using a solid aluminum rear plate, which assists heat dissipation in demanding environments. Constructed from up to 18mm of MDF, the height and overall size of the cabinet has been reduced thanks to a newly developed angled-corner port system. These ports have been individually tuned to maximize low-end punch. The cabinets of the 10, 12, and 15-inch models feature dual-angle pole-mount sockets to ensure that the HF hits the target. All two-way models have comprehensive rigging options as a result of five M8 points. For physical protection, all Sigmas are coated in the latest generation chip-resistant Rhino Rock paint. The Bottom Line: With their unobtrusive design, the new Sigma Series is well suited for installations where audio quality, rigging options, and discreet cosmetics are critical.